My Note: I met Gayle Sulik a few years ago when I was in Williamsport, PA, where she & I lived at different times. She was doing a book signing at Freshlife Foods which my friend Barb Jarmoska owned and I reviewed her outstanding book, Pink Ribbon Blues. Since then I have been receiving her newsletter and I am reprinting her most recent in its entirety with Gayle’s permission. In this posting, Gayle tells how she became so involved in all the hype about the pink ribbon campaigns, which may not being doing all it could or should, as Gayle notes in her book. (She cover and link at the end of Gayle’s posting.) Thank you, Gayle. It all started with Cathy. Then after Rachel came into my life I knew the critical stance I had taken on the culture and industry surrounding breast cancer would keep going until meaningful change became a reality. As with many people involved in social movements, my breast cancer research and advocacy started from a personal interest. My friend Cathy was diagnosed with breast cancer at age 30. Only about 5 percent of breast cancer cases involve women under age 40, and she was one of them. After Cathy completed her year or so of surgery, radiation, and chemotherapy her doctors found no evidence of disease. Then at age 35, the cancer came back. Such “recurrences” happen 20 to 30 percent of the time regardless of the stage at which a person was diagnosed. This time the cancer was metastatic (transmission from the original site to distant organs of the body, usually the bones, lungs, liver, or brain). Cathy would remain in treatment for the rest of her life, until the treatments failed or became too toxic. She died just after her fortieth birthday. In the years before Cathy died, I learned more about breast cancer both from her experience and from a local advocacy group called Capital Region Action Against Breast Cancer (CRAAB!). Two feminist biologists founded the group so my entrée into breast cancer as a social problem came with a critical, feminist science perspective. I learned about biomedical uncertainty and the etiology of breast cancer, scientific controversies, political underpinnings, and feminist goals of empowered decision making. I always shared what I learned with Cathy. She wondered why she’d never heard it before. We concluded that information like this was omitted from health communication and self-help materials as well as many awareness campaigns. 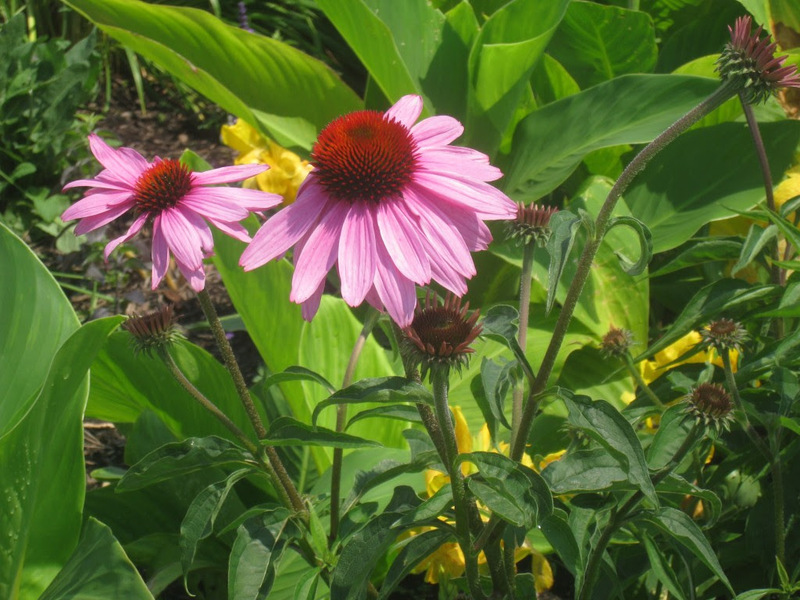 After Cathy died I considered participating in a 3-day breast cancer walk in Cathy’s memory. I realized this was a default reaction. Taking part in a fundraiser might help me to feel better, but it would do nothing for Cathy. It would not change the conditions that got her a breast cancer diagnosis and failed to cure it, nor would it address those thorny feminist science questions we both had. I needed to study it. I set out to do my dissertation research on breast cancer and women’s decision making. I analyzed medical consumerism and public health policy, and examined breast cancer advertisements and awareness campaigns, biomedicalization, and the science that was either promoted or omitted from health promotions. Finally, I realized what that pink ribbon was about. Breast cancer, the social cause, functioned like a brand name with a pink ribbon logo, just like Nike and its swoosh. 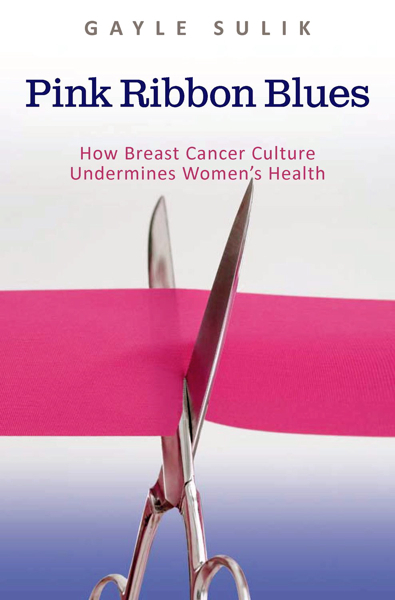 I saw the system behind the ribbon and was ready to finish my book, Pink Ribbon Blues: How Breast Cancer Culture Undermines Women’s Health. After Pink Ribbon Blues came out I met Rachel, another young woman living with metastatic breast cancer (“mets”). 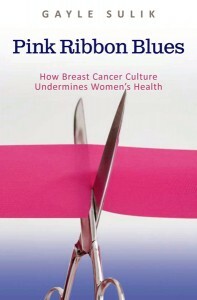 Rachel regularly commented on my Pink Ribbon Blues blog, and I started to read her blog The Cancer Culture Chronicles. I assumed from her writing that Rachel must have been another social scientist. She was not, at least not formally trained as one. Before breast cancer took her out of the paid workforce, Rachel had been a certified public accountant. Rachel and I emailed, had conversations, collaborated on essays, planned projects, and committed to turning the breast cancer tide. She had never been an activist, but Rachel was so angry about what she had dubbed “pink lollipop land” and the exploitation of her disease that she felt compelled to speak her truth and join provocateurs like me. In Rachel, I found my right hand (though she was a “leftie”) and a sister who would whisper in my ear almost daily, “This needs a good Sulik-ing.” I’d take a moment to smile, thinking of my last name as a verb. I was impatient to see change, especially because I knew my time with Rachel was limited. Living with “mets,” she was already in a drug-switching cycle of trial and error, with ongoing side effects, medical emergencies, physical decline, and a penetrating existential awareness. My heart sank when she told me how she was feeling day to day, and the kinds of decisions she made, such as whether to check the magazine renewal box for one year or two; she checked “one.” When she lost the use of her left hand, referred to as “the hand,” as if it didn’t really belong to her, Rachel continued to peck the keyboard with her non-dominant hand. When my friend and partner in activism died a few months later at age 41, we had known each other for only 15 months. It felt like a lifetime. My ongoing work as a public scholar activist is dedicated to Rachel Cheetham Moro (August 2, 1970–February 6, 2012) and Cathy Ann Hoey (November 25, 1960–January 17, 2001). Neither of these women could have known how much influence their lives would have on breast cancer activism or how their voices would continue to matter after they were gone. Excerpted with permission from the article “#Rethinkpink: Moving beyond Breast Cancer Awareness.” SWS Distinguished Feminist Lecture, published by Gender & Society, volume 28, number 5, pp: 655-678. Over the last 30 years the breast cancer movement has worked to make breast cancer a national priority, raise awareness and funds, galvanize social support, and impact the direction of research. Women have been at the forefront of information sharing, activism, and patient empowerment. Treatments have improved incrementally and mortality rates have declined overall. By these indicators, the movement is a success. Yet, 70 percent of those diagnosed with breast cancer have none of the known risk factors, making causation and prevention uncertain; approximately 40,000 women (and men) die from metastatic breast cancer each year, a number that hasn’t changed for decades; corporate and political agendas stand in the way of patients’ rights and access to quality care; profit motives and disease branding supersede efforts to provide meaningful support and accurate health information; and breast cancer is popularized to the degree that “pink consumption” has become more of a trendy pastime than a rallying call for social change. Tenacious activists and a growing number of citizens, though divergent in the problems they tackle and methods they use, share a critical stance that fosters new thinking about breast cancer and calls for transparency, accountability, and alternatives to the pink ribbon. This entry was posted on Friday, October 3rd, 2014 at 2:45 pm	and is filed under Health Matters: Flashes & Reports. You can follow any responses to this entry through the RSS 2.0 feed. You can skip to the end and leave a response. Pinging is currently not allowed. and subsequent cancers such as melanoma at the site develop. Why should a women be receiving treatments facing the radiation machine on their back. wouldn’t it make more sense to protect the rest of the body from exposure by by just having a hole where the breast alone can be exposed.